In university hostels the month begins with 555s and Marlboros, by the late 20s it comes to beedis – traversing Classic, Wills Navy Cut and choti Gold Flake on the way. The best time for a beedi is when you are drenched wet and the best part is that even the poor labourer doesn’t mind giving you one from his bundle. This selfless sharing is also evident (to a much greater extent) amongst khaini khanewalas. Coming back to the beedi, the Who’s Who wouldn’t like to be seen puffing one (with the exception of actors – oh! now even they can’t) least the others say Who’s That? But the bags they come packaged in demand a high price. 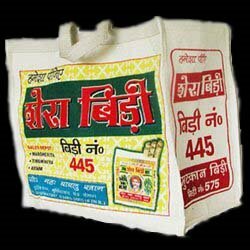 Overstock.com is selling ‘Bidi Bags – Vintage Indian Ad Canvas Totes‘ for a listed price of $30. The actual selling price is 33 per cent lower (the trick always works). There’s also the Kayam Churana bag on sale. These Vintage Indian Ad Canvas Totes are a fun and unique way to carry your groceries, gym, yoga, or beach gear. * Kayam Chooran – Here, ‘Kayam’ means physically fit and ‘Chooran’ is an herbal digestive powder. So, ‘Kayam Chooran’ refers to an herbal digestive powder which, when ingested, keeps you fit! Statutory Warnings: Cigarette/beedi smoking is injurious to health. Chewing tobacco is injurious to health. Not meant for minor. Just playing safe. Today it is the movies; tomorrow it might be the blog. You have to plan for the future.